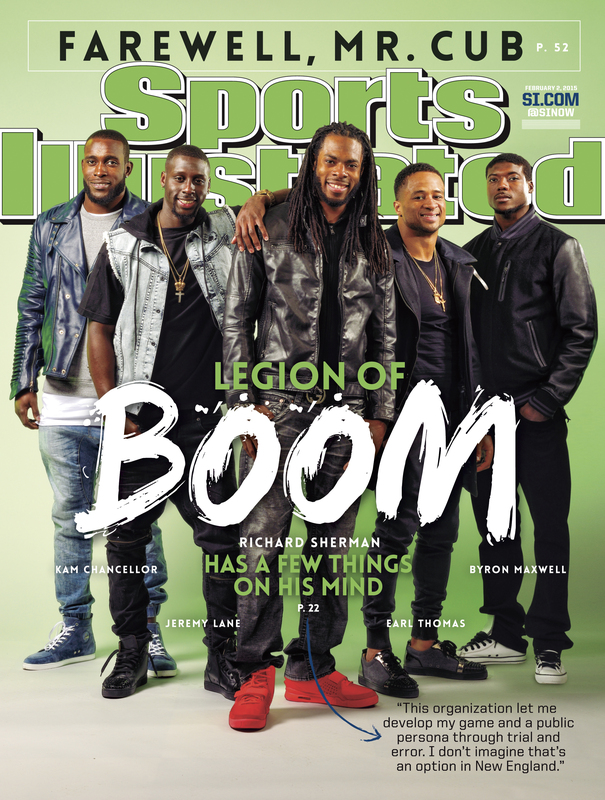 NEW YORK, NY (January 29, 2015) – This week’s Sports Illustrated cover features Seattle’s Legion of Boom. As the Seahawks line up for another run at the Lombardi Trophy, Richard Sherman exclusively offers his own take on the state of the game, while also reflecting on how he will evoke change by being a great role model. Andy Benoit analyzes the three key arguments for the Seahawks and the Patriots, including Russell Wilson’s speed and New England’s hidden gem in Devin McCourty. With all eyes on “deflategate,” Ben Raskin recaps past Super Bowl distractions. This week’s regional cover pays tribute to Mr. Cub – Ernie Banks and his impact on the Chicago Cubs. In remembrance, Rich Cohen discusses Banks’s life and how he became –and still is – the heart and soul of the Wrigley Field faithful. The two-time national league MVP and Hall of Famer’s buoyant spirit never changed throughout numerous losing seasons. Also in the issue, Luke Winn delves into Coach Larry Krystowiak and how he’s transformed the University of Utah Men’s Basketball program from a historically bad team to one that has Final Four potential. Winn explores the turnaround for a program on the verge of having its best season record since 1998. Albert Chen takes a look at the growing industry that is daily fantasy sports and the way it has captivated fans, while maximizing revenue and expanding its demographics. Lee Jenkins delves into the life of Michael Kidd-Gilchrist and the struggles he’s endured since entering the league. Before Richard Sherman became the center of the media’s attention he received a contract extension, and when asked what the increase in pay would do for him he simply replied that he wasn’t playing football for the money but rather to be the best in the game. In this piece, Sherman discusses not only his Legion of Boom teammates, Kam Chancellor, Earl Thomas, Byron Maxwell and Jeremy Lane, but also his coach, Pete Carroll. Sherman, conveys his disappointment in Roger Goodell, as well as NFL management, talks about the difficulties that New England’s offense might pose and speaks on the league’s top defenders (hint: It’s not who you think). This is not just a football piece by a football player though, Sherman seamlessly transitions from football life to the everyday world as he opens up about media scrutiny and social issues that players face but are not allowed to speak out on and relates all of this into how he plans on being the best role model he can be as he prepares for the arrival of his first child, and the challenges that lie ahead for him. With new fantasy leagues emerging constantly, each day can be a payday for players of snake drafts or keeper leagues. Growing from 500,000 participants in 1988 to over 40 million in 2014, fantasy football has become more than a hobby; it’s become a way of life to those willing to invest. Daily fantasy sports (or, DFS as the professionals call it) have turned amateur fans into stat-studying magicians who live and die by mathematics, analytics, spreadsheets and just a bit of intuition. But more than just a nice payout, DFS leagues are changing the way fans interact with the game, as well as the way that leagues interact with fans. MLB has a sponsorship deal with DraftKings, as does the NFL and the NHL while the NBA has inked a four-year partnership with FanDuel. Leagues have shown their support for these games and the revenue for the companies has ballooned to $97 million between them. This much is clear; the traditional season long fantasy games are long gone and the bright future that is DFS has only begun. Thanks to a former NBA player, a one in 1,000 recruit and the Navy SEALs, head coach Larry Krystkowiak – and his childhood mantra– have brought the Utah Utes from historically bad to Final Four good. After landing recruit Jakob Poeltl in a lottery that included 1,000 other schools (according to Poeltl’s mother) and enticing young guard Delon Wright– brother to the NBA’s Dorrell Wright– to stay in school rather than enter the NBA draft coach Krystkowiak began to see the results he knew would come. This Coach K saw it all. He became the coach with only four players returning, lost his starting center to injury and became desperate enough to hold walk-on tryouts for starting jobs. Through it all, he knew that the train was, moving though, and used exercises employed by the Navy SEALs, a scholarship offer that landed him a top 100 recruit and a stingy defense to get the Utes to where they are today– on the brink of greatness. They are on pace to finish with their best record since Andre Miller and the 1998 squad landed in the national title game and it comes as no surprise to anyone on the team. For many players a 19-foot jumper and a smooth postgame interview would be nothing to blink at. For Michael Kidd-Gilchrist it represented a culmination of a lifetime of hard work. Recruiting for Kidd-Gilchrist started when he was seven; at 12 he was friends with Jay-Z and his middle school team was sponsored by Reebok. He played alongside No.1 pick Kyrie Irving in high school and alongside No.1 pick Anthony Davis in college. He won a national championship in 2012 and was selected No.2 overall by the Hornets in the NBA draft. But while Davis and Irving thrived in the NBA and gained All-Star status, Kidd-Gilchrist struggled to find his identity. He enlisted the help of shooting guru Mark Price to fix his erratic shot and mend his confidence while he also sought assistance from a speech pathologist to help him with his stutter. At age 21 he has overhauled so many things about himself during his long journey that he is at last comfortable with where he is makes that jumper and his perfect post-game interview that much sweeter. Sports Illustrated pays tribute to Mr. Cub. An inextinguishably bright light on some very grim teams. He was, and remains, the heart and soul of the Wrigley faithful and the city of Chicago. Losing with him wasn’t always fun, but losing without him would have been intolerable.